This is a meme hosted by Cindy at Cindy's Love of Books, where you list your books or bookish items bought either in a week or month or whenever. Well, I was with a friend at Fairview Mall on Monday, and we decided to take a quick look in the children's section of Winners. They always have books at great prices. I wasn't disappointed. 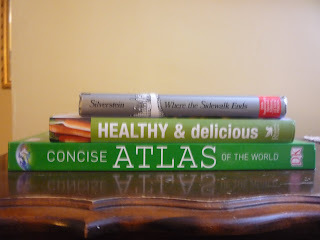 I picked up a beautiful DK Concise Atlas of the World (we really needed one) and also the classic, Where The Sidewalk Ends by Shel Silverstein (30th Anniversary Special Edition). Believe it or not, we did not have it in our collection. (My kids absolutely love The Giving Tree by this same author.) So I decided to read some of the poems last night with the kids and we howled with laughter. I could barely read some of them because by the time I got halfway through the book we had the giggles so bad we couldn't stop. On the way to the cash register, I spotted the cookbook, Reader's Digest Healthy and Delicious: How to eat 5 vegetables a day the easy way. The photos were mouthwatering and I simply couldn't resist! It's been awhile since I bought a cookbook. And adding more veggies to my family's diet is a constant battle these days. It seems once kids hit 5 years and older their taste buds change. I'm hoping this cookbook can offer some tasty solutions. So what have you bought this week? Hi Laura Thanks for taking part in my meme. I always forget when I go to Fairview to check out the books at Winners. I will have to make a mental note of it for the next time.